A certified machinist sustained deep cuts to his left palm and to the top of his left forearm while operating a lathe. As he stepped closer to examine his work, his sleeve got caught on the spinning metal. His hand and arm were pulled in between the spinning jaws and chuck and a fixed part of the lathe. The worker immediately pressed the emergency stop button on the machine and pulled his arm out. Lathes can be dangerous. Incidents of serious injuries and death continue to be reported. 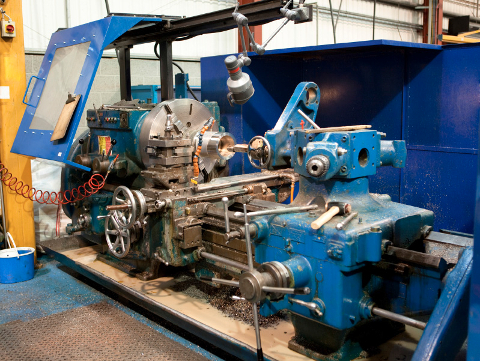 Due to the design and operation of a lathe, they are challenging machines to guard. Technical and mechanical advances now make guarding a viable option. As such, WorkSafeNB promotes the use of adequate safeguards to prevent further incidents. Section 242 of General Regulation 91-191 requires employers to provide adequate safeguards to prevent employees from contacting moving parts on a machine. If a safeguard cannot be provided, the employer must make a physical modification to the machine or prepare a written safe work procedure. Where a guard that does not impede the work of the machinist can be installed (especially over the jaws and chuck), the employer is responsible to ensure a safeguard is installed. When the guard installation impedes the planned work, a physical modification to the machine may be required. If a physical modification is not an option, a safe work procedure must be developed and discussed with the machinist before work is done. The following websites provide examples of safe work procedures. They should be adapted to the lathe being used and work being done.